On this page we will introduce you to some of the different types of Irish songs. Enjoy the journey! 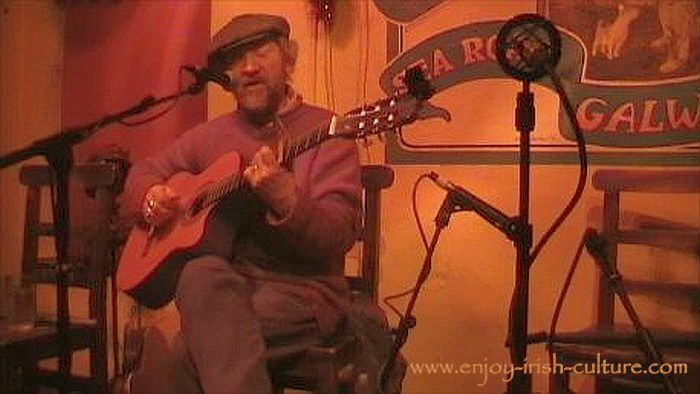 Ger Carthy at the Crane Bar, Galway, Ireland. The best known types of Irish song today are all in the English language which means they are no older than about 1790. English was gradually spreading westward then, but Irish was the predominant language especially among the poorer people, until the Irish Famine. Watch Tim Lyons perform a traditional humorous song here: 'The Price of the Pig'. Watch Brian O'Rourke perform a traditional Irish song in the Irish language, entitled Cáit Ní Ghaóir, a woman's name, used as a personification for Ireland. This song is an Aisling. These date from about 1800 on and are almost all in English. Rebel songs often relate to actual historical events, and strongly express an Irish point of view. Rebel songs laud the many Irish rebellions against English oppression over the centuries. As the name says these are songs lamenting Irish emigration which became a large scale phenomenon from the onset of the Irish Famine in 1845, and, it may be said, is still continuing today. Emigration songs are very popular even today. These can relate to any subject area, as long as they are funny. Like most English language songs, they are no older than the early 1800’s. There are many humorous songs in the traditional style being composed today, for example by Tim Lyons, Con Fada Ó Drisceoil, Sean Mone and by me, Brian O'Rourke). You can watch a traditional humourous song performed by Tim Lyons at the top of this page. A lament is a sad song, the type of song sung when the women are keening at a wake, a song of loss. Laments are still popular today. An example for a lament is the sean nos song Amhrán Mhuighinse. An 'Aisling' is a type of traditional song in which a woman character personifies the country of Ireland. In the song the woman usually makes a prediction that Ireland will be free again one day. It has been said that personification was used to guard against persecution in times of English oppression. I am not certain that this was so, seeing that in the English language versions of these songs, the content and meaning would be very easily understood by English speaking authorities. Instead, I have come to see the Aisling as a particular art form. Ballads – songs telling stories – came in from England and Scotland from about 1600 onwards. Throughout the 19th century, Irish story-songs became common in English. Ballad singers travelled around the country singing at fairs and other social gatherings. The songs often concerned some tragic event which could be personal or historical. There were plenty of those to draw on from Irish history. When ballads became really popular, the ballad singers in the street would sell song sheets that people could take home and learn. There are many such songs; every county in the country has its own selection praising the beauty of the place. Some of them are better known than others because they have gotten more exposure through popular singers. For example, there is a famous version of Galway Bay by Dolores Keane, and everyone knows this song. Another very well known song that you will hear at many singing sessions is The Cliffs of Dooneen. 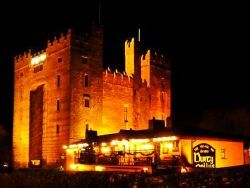 The Irish song tradition is being kept alive not only by the singing of traditional songs, but also by modern compositions in the traditional style. There are modern ballads, modern humorous songs, and modern versions of emigration songs (John Tunney, Michael Marrinan). Such songs are regularly sung at singing sessions. They might become traditional themselves over time. For the moment they are referred to asbeing ‘in the traditional style’. Watch two modern day songs in the traditional style by Brian O'Rourke here, 'Carnations'- a song which is popular with any and every audience and made people fall over themselves at our wedding, and 'Aisling-Og'- a song about love gone wrong. Enjoy! These days, Irish language songs have a modest presence at singing sessions, reflecting perhaps the overall percentage of Irish speakers. However, many singers feel that the quality of Irish language songs is much higher than that of the English language song. Watch a beautiful Irish language song performed by Brian O'Rourke here. The English language was new to most people at the time that many of these songs were created. Remember that English only became the more dominant language in Ireland after the Famine. People were new to the language and didn't master it well. Often, the lyrics of the earlier English language songs sound awkward. There are however many exceptions to this trend: a number of remarkable songs were composed in English, particularly in the north of Ireland. These songs often have remarkable melodies also. Irish language songs very often have beautiful poetic lyrics and use very particular types of rhymes called internal rhymes that work very well in Irish, but not so well in English. singing sessions occasionally and it's well worth the wait. Hearing sean nós singing is a unique experience. It feels like you are being transported back a few hundred years. Hi there! We hope you liked our page on Irish songs. We certainly enjoy researching these topics and assembling this website for you! We'd like to ask you for a small favour in return- it will only take a few seconds of your time. Would you please, kindly, give a social shout out about our website so that more people can find us and will be able to enjoy the content we provide, too. Thanks a million! Warmest regards from Colm and Susanna.